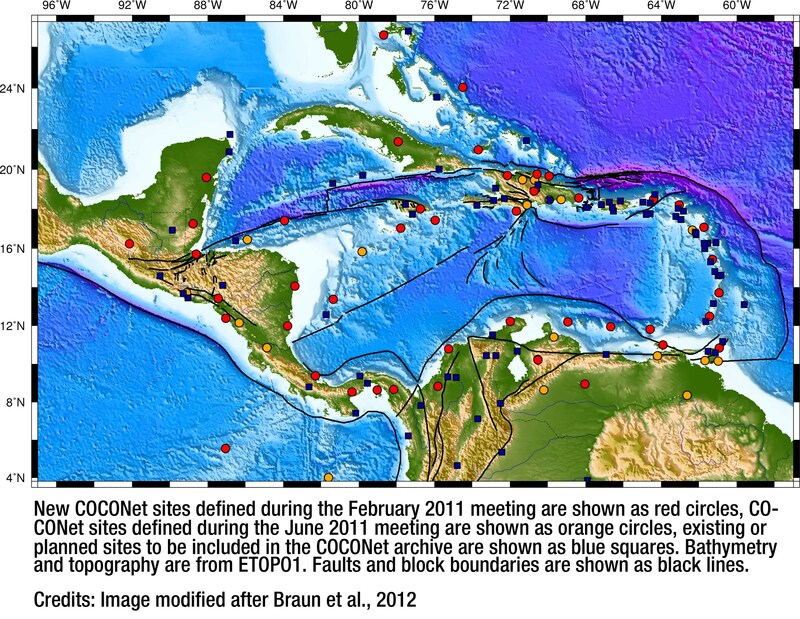 The Continuously Operating Caribbean Observational Network (COCONet) is a project funded by the National Science Foundation (NSF) with the aim of developing a large-scale geodetic and atmospheric infrastructure in the Caribbean that will form the backbone for a broad range of geoscience and atmospheric investigations and enable research on process-oriented science questions with direct relevance to geohazards. The Mw 7.0 Haiti earthquake on 12 January 2010 was responsible for more than 220,000 fatalities, 300,000 injuries and one million people made homeless according to Oxfam International. The tragic human toll of such a sudden and energetic event in a poor region with limited to non-existent hazards mitigation or emergency response capabilities compels the broader community to act to limit human losses as well as economic losses. Beyond the initial response to the earthquake, there is a need to better understand Earth processes that lead to a variety of hazards in the Caribbean in order to proactively reduce the risks to people and property. Hurricanes and severe storms are relatively familiar hazards in the Caribbean, and even though significant tectonic events have also occurred frequently, the public is less familiar with earthquakes and certainly more vulnerable because there is no warning before an earthquake. The U.S. National Science Foundation (NSF) is supporting the development and operation of a network of geodetic and meteorologic instruments throughout the circum-Caribbean to conduct research to understand a complex multi-hazards region. The Continuously Operating Caribbean GPS Observational Network (COCONet) will include at least 46 new GPS/weather stations, 21 refurbished sites, and 77 contributing stations in a consistent set of data products that are useful for hazards assessment. The existing stations are operated by partner organizations in the various Caribbean and Caribbean-border nations. The NSF awarded UNAVCO, Inc. with a grant to install the new stations, update some existing stations, organize an open access database archive for COCONet data, and provide tools and training for the instruments and the data. COCONet is continuing to move toward the end of the installation phase. The majority of stations are operating and providing high quality data for short term and long-term research. The Mw 7.6 Nicoya earthquake on 5 September 2012 between the subducting Cocos plate and overriding Nicoya peninsula of Costa Rica did little surface damage but was exquisitely recorded by COCONet in collaboration with the Costa Rican National Volcanic and Seismic Observatory (OVISCORI). These data will provide information about the spatial extent, magnitude, and direction of motion of the earthquake and its associated aftershocks. COCONet data will allow geoscientists to decipher how and at what rate the Cocos and Caribbean plates are moving, how much strain may be accumulating along the plate boundary and how the 2012 event relates to previous seismic activity. The earthquake may also affect nearby volcanoes that line up along a volcanic arch above the subducting plate. Some of these volcanoes are monitored by the GPS stations for signs of inflation or deflation related to magma movements that might signal an impending eruption or change in volcanic activity. The University Corporation for Atmospheric Research (UCAR), a collaborating organization on the NSF award, is leading the data services and analysis for the meteorological information of COCONet. The new and refurbished GPS stations in COCONet are being equipped with meteorological instrumentation to collect surface temperature, barometric pressure, horizontal wind speed, and rainfall. This effort is in support of, and in conjunction with, various weather institutions in the region. GPS data can be analyzed using advanced processing methods to determine the delay of the signals as they pass through the atmosphere. When these estimates of delay are combined with surface meteorology observations, they can be transformed to represent the column-integrated amount of water vapor in the atmosphere, a measure called precipitable water vapor. 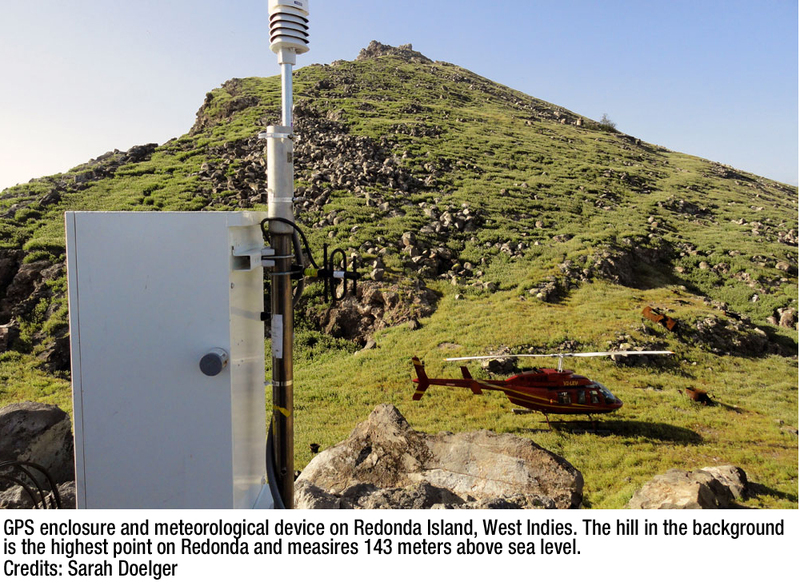 These direct and continuous measurements are needed to improve our understanding of the high impact atmospheric hazards that are important to the Caribbean. Applications include studies of the hydrological cycle, the evaluation of climate models, hurricane intensity studies, and the improvement of weather forecasts. The severe weather events that travel through the region will be tracked with valuable observations from COCONet to support the development of more accurate forecasts to the Caribbean, United States and Mexico. Data collected from GPS stations are increasingly being used in a broad array of scientific disciplines. The data from COCONet are no exception. Upper atmosphere scientists will use COCONet data to measure changes in the total electron content in the ionosphere, helping to detect space weather events that may harm communications and power systems. In a separate application, at least two COCONet stations will be collocated with tide gauges to support research in quantifying changes in sea level as a consequence of a changing climate. Lastly, work is just beginning to use secondary signals that reflect off of surfaces that are nearby the GPS antenna. These reflected signals may provide information about wave heights, tides, and other sea surface conditions that may support research efforts in understanding Earth processes, especially the coupling of the atmosphere, ocean and solid Earth. COCONet will provide information to emergency managers, land use planners, decision makers and others as they work to reduce the risks from a bevy of natural hazards, especially severe storms, flooding, hurricanes, landslides, volcanic eruptions and earthquakes. Indeed the installation of two GPS stations in the Dominican Republic has significantly improved the post positioning accuracy that is useful for thousands of surveyors for daily use and for geoscientists trying to determine the plate dynamics that contribute to earthquake hazards. Improved forecasts, modeling and risk assessments will allow communities to prepare for many different hazards and mitigate their dangers. The network and the data will benefit the surveying, land use planning, navigation, communication and emergency management sectors. COCONet will help further develop the science and engineering workforce of the twenty first century in the circum-Caribbean with benefits for the broader research community and society overall. More information and data access can be found at coconet.unavco.org.